The UCLA Civil Rights Project has released a re port, entitled U.S. Immigration Enforcement Policy and its Impact on Teaching and Learning in the Nation’s Schools. The researchers, led by Dr. Patricia Gandara, surveyed thousands of educators across the U.S. and found that the teachers and administrators have noticed the impact, including increased absenteeism, behavior or emotional problems, and academic decline. 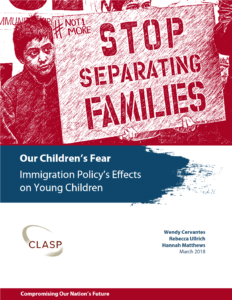 The Civil Rights Project and the Migration Policy Institute co-hosted a convening and webcast at the Wilson Center to release the report as well as a companion paper about the impact on educators, Stressed, Overworked, and Not Sure Whom to Trust: The Impacts of Recent Immigration Enforcement on our Public School Educators. The report finishes with Federal, state, and local policy recommendations as well as recommendations for the philanthropic community. 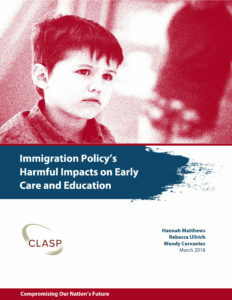 The four reports all highlight what educators across the country can tell you – immigration policies are deeply impacting the students, their families, and the educational staff they interact with on a daily basis.